Cancer is made up of abnormal cells that grow even though your body doesn't need them. In most cancers, the abnormal cells grow to form a lump or mass called a tumor. If cancer cells are in the body long enough, they can grow into, or invade, nearby areas. They can even spread to other parts of the body. This is called metastasis. Hodgkin lymphoma is a type of cancer. It’s also known as Hodgkin disease. It starts in the lymphatic system. 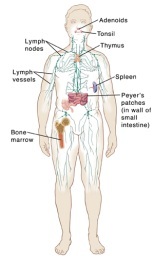 With Hodgkin lymphoma, cells in the lymphatic system grow out of control. This most often happens in the lymph nodes. The mass of extra cells form a tumor. Sometimes tumors form in the spleen or in other organs. Lymphocytes. These are a type of white blood cell. They fight infection and disease. Lymph. This is a clear fluid that contains lymphocytes. Lymph vessels. These are tiny tubes. They carry lymph fluid from areas of the body back to the bloodstream. Lymph nodes. These are small organs about the size of a pea. They are found in your underarms, groin, neck, chest, abdomen, and other parts of your body. They filter the lymph fluid as it moves around your body. Other organs and body tissues. The lymphatic system includes the bone marrow where blood is made. And it includes your spleen, thymus, adenoids, tonsils, skin, and digestive tract. When you have Hodgkin disease, cells in your lymphatic system (usually in your lymph nodes) grow out of control. Lymph nodes are small collections of cells called lymphocytes in various places in your body, such as your armpits and groin. They help your body fight infection. The mass of extra cells form a tumor. Sometimes tumors form in the spleen or in other organs. Hodgkin disease is unusual in that only a minority of the cells in the tumor are malignant (cancer). Hodgkin lymphoma can start in any part of your lymphatic system. It can then spread to more than one area of your body. The lymphoma may also spread to your bone marrow and to other organs in your body. Lymphoma can spread in different ways. It depends on the type of lymphoma and where it started growing. Lymphoma that begins in an organ that is not a lymph node, such as the stomach, is called extranodal lymphoma. This type of lymphoma tends to spread first to the lymph nodes near that organ or to sites other than the lymph nodes. Hodgkin lymphoma is different from other types of lymphoma. The other types of lymphoma are grouped together and called non-Hodgkin lymphomas. With Hodgkin lymphoma, cancer cells only make up a small part of the cells in a cancerous lymph node. The rest of the cells are normal immune cells. The cancer cells are usually special cells called Reed-Sternberg cells. In non-Hodgkin lymphomas, cancer cells make up most of a tumor. There are no Reed-Sternberg cells in the tumor. Hodgkin and non-Hodgkin lymphoma also differ in the way they spread and in how they are treated. Hodgkin lymphoma is one of the most curable forms of cancer. Nodular sclerosis (NS). This is the most common subtype. In every 5 people with Hodgkin lymphoma, about 3 to 4 have this subtype. It occurs more often in adolescents and adults under age 50. It’s more common in women than in men. Most people with NS don't have any initial symptoms. When the disease is found, it is usually at an early stage. Mixed-cellularity (MC). This is the second most common subtype of Hodgkin lymphoma. About 3 in 20 to 3 in 10 people with Hodgkin lymphoma have this subtype. It can occur in all age groups, but it occurs more often in older adults. It is more common in men. Most people aren't diagnosed until the disease is in a later stage. Symptoms of fever, night sweats, and weight loss (B symptoms are very common. These often help the doctor diagnose the disease. Lymphocyte rich (LR) or lymphoid proliferative (LP). LP Hodgkin disease is usually found in people in their 30s and 40s. It accounts for fewer than 1 in 20 cases. More men than women get LP Hodgkin disease. The cure rate is very high. B symptoms are very uncommon. Lymphocyte depleted (LD). This is the fastest-growing type of Hodgkin lymphoma. This subtype is very rare. Only 1 in 100 people with Hodgkin lymphoma have this subtype. It is more common in older adults. Most people with LD are diagnosed at an advanced stage. Nodular lymphocyte-predominant Hodgkin lymphoma (NLPHL) makes up about 1 in 20 to 1 in 10 of all Hodgkin lymphomas. It is more common in men than in women. It usually affects people younger than 35. Most people are diagnosed at an early stage. Most people have a full response to treatment. Classic Reed-Sternberg cells are not seen in tumors, or are very uncommon. Instead, a tumor has large cells called popcorn cells. The recovery for NLPHL tends to be very good overall. But a small number of people will go on to develop a type of non-Hodgkin lymphoma that grows more quickly. If you have questions about Hodgkin lymphoma, talk with your healthcare provider. Your healthcare provider can help you understand more about this cancer.